Our talents really shine when something very specific is needed. This piece was made for a guest room where every inch mattered. It functioned as a daybed, as well as a guest bed that was longer and slimmer than a twin mattress. The look needed to be soft and French and we constructed the piece with a firm poly/Dacron cushion. It featured an easily removable seat cover and the frame had a soft painted finish accented with gold leaf. 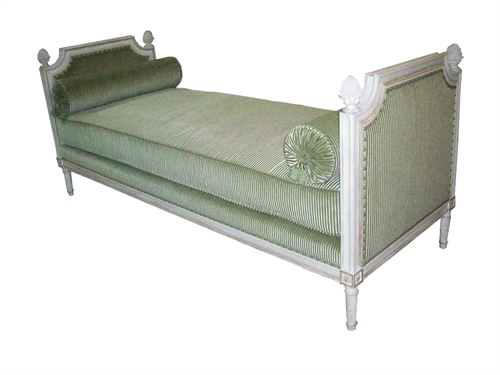 This daybed is available in any size and finish for your C.O.M.